Salon professionals everywhere understand how messy wax can get when trying to keep everything clean between clients. And more often than not, the time between bookings is minimal, so there’s not much chance to scrub away dried wax from appliances, countertops and floors. With Terry Binns’ selection of body wax cleaners, you’ll be able to clean surfaces in no time! Estheticians everywhere agree – these body wax removal products get the job done in the few minutes you have to do it. Terry Binns is proud to offer Zestasol, ReMovelt and GiGi wax removal products at the lowest prices on the market. Each brand is known for its high quality and reliability when you need it most. Whether you’re removing wax residue from vinyl or from a couch cushion, you’ll have the best product to do it with – and quickly. What’s more, Terry Binns offers free shipping on orders over $200 and same-day shipping on most orders. You’ll also have access to our staff of knowledgeable salon professionals to answer any and all questions. Place your order for wax removal solution today, and make your day that much easier. 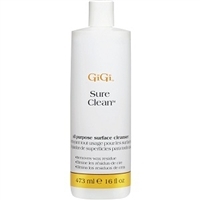 GiGi Sure Clean is the fast and effective way for removing wax from most surfaces. Fresh, natural citrus-formulated cleaner that effortlessly removes wax buildup. Ideal to clean wax spots on floors, metal, vinyl, melamine, bed covers, towels, and waxing accessories.